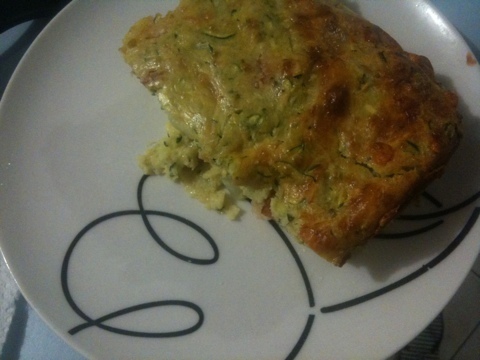 Zucchini slice is my number 2 comfort food. Largely because of how easy it is to make. You just plonk all the ingredients into a bowl, mix, pour into lasagne dish, put it in the oven, and wait (or in my case knit). it’s one of those recipes that my mum used to make all the time – which is probably why it’s so comforting. and it’s one of the only ways that my boy will eat zucchini – mostly because of the bacon and the cheese. but it’s really good, really easy, and really comforting. and can be eaten hot out of the oven, or cold for work lunches. 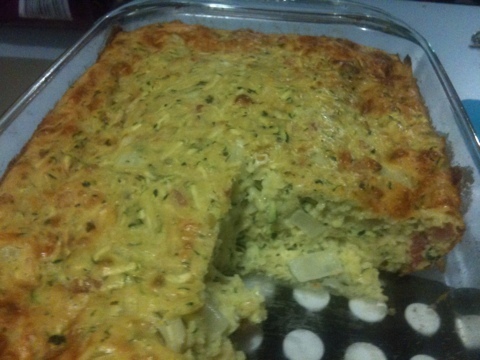 Last night it was great because i didn’t feel like cooking, and i had a zucchini all ready in the fridge.